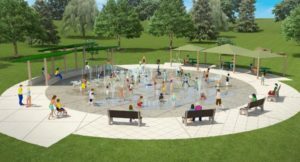 In August, Gwinnett County broke ground on an expansion of Graves Park that will include an interactive fountain and a new soccer field. In addition to the interactive fountain for the kids, the Phase II expansion of Graves Park will include a 1.2-mile unpaved loop trail with two wood bridges that will connect to existing trails at the park. The park will feature a specially treated, soil-based soccer field, the first of its kind in Gwinnett’s park system, plus landscaping and irrigation in other parts of the park. The park improvements are expected to be complete by summer 2019. Graves Park is located at 1540 Graves Road in Norcross, within the Gateway85 CID district. More information, visit the Gwinnett County Parks and Recreation website.